If you love anything buffalo flacor and you love cheese, you are going to fall in love with our Buffalo Muenster Chicken Skillet! This is one of Matt's spur of the moment ideas where he had to see it through. Although I did the cooking, he insisted on taking credit for it. I was actually very impressed with this dish and find myself day dreaming about it. What's not to love about a one pan recipe?! All the ingredients are combined in one pan and you could serve it up family style. Although I create the buffalo sauce in a separate saucepan, you could technically just add all the components to the chicken and make the clean up even easier. Trust me though, you want to use the exact buffalo sauce recipe I gave you below, it's incredible. 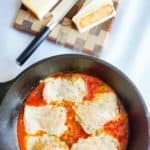 Some of our Best Chicken Recipes! This is definitely high up on the list of one of our best chicken recipes. Both Matthew and I prefer chicken over any other meat, so we definitely don't skimp on great chicken recipes. If you are at all like us or at least enjoy your fair share or chicken you must give our Low Carb Chicken Chili and Easy Cashew Chicken a try! Check out all of our keto chicken recipes. Skillet recipes are great meals to turn to any night of the week. They are quick to put together and can feed a family of two, four or six people! This recipe in particular can be tailored to whatever cheese and hot sauce you have in the fridge. Although I said the buffalo sauce in this recipe is incredible, and I wasn't joking. I know many of you have a hot sauce preference and I respect that. Just remember that when it comes to chicken skillet recipes it's important to have a little fun and make sure you over do it on the cheese portion hehe. Recipe can be quickly added to MyFitnessPal - Search "KetoConnect - Buffalo Muenster Chicken Skillet"
Combine butter, hot sauce, garlic powder and apple cider vinegar in a sauce pan on lot heat. Trim excess fat from thighs and pat dry. Season on both sides with salt and pepper. Heat a large skillet over medium high heat and add coconut oil/ghee. Place chicken thighs into pan in an even layer and allow to cook 3/4 of the way through. Flip the thighs and cook for additional minute. Pour the buffalo sauce mixture over the chicken thighs and allow to cook for an additional 5-7 minutes. Thighs should be fully cooked at this point. Place a slice of cheese over each thigh and cover the skillet with a lid for 3-5 minutes. The cheese will have fully melted into chicken and sauce.